• Save more than 80% power consumption, high brightness. Easy installation, no drilling hole are needed, just screw it into the holes on your boat. • With IP68 watertight degree, it is perfect for swimming pools, ponds, fountains, aquariums, recreational facilities, decoration underwater, park lake, water and other outdoor stage for atmospheric decoration. • Qualified aluminum housing: better heat dissipation, so it is safer and more durable, suitable for indoor and outdoor use. 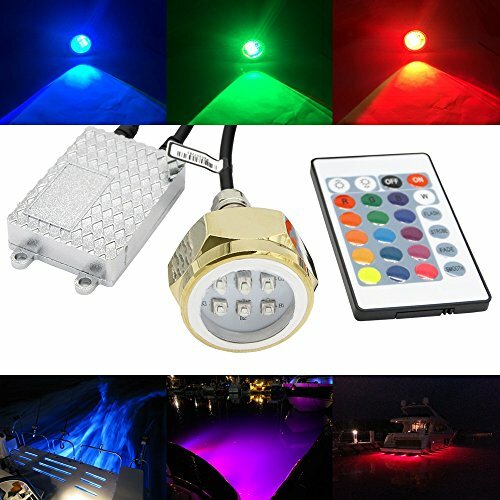 As a light display for wedding, birthday party or fast night, night barbeque or as safety lighting. etc. Single LED 3W with 9 LED insides, total 27W super brightness. Bronze housing materials, 100% anti-corrosion. 1800 Lumens light output with 120 Degree viewing angle. Easily replace the existing 1/2" drain plug on the boat, no need to drill hole on boat. Simply screw into the 1/2" threaded entry and connect wires to a switch. Waterproof : IP68. Connected with waterproof connector in order to easy installation, no drilling hole are needed, just screw it into the holes on your boat. Install for both small or large boat with DC8-28V built-in driver. Super bright. Penetrates deep into the water for a large range output of light. Change color via a remote control. If you have any questions about this product by NSLUMO, contact us by completing and submitting the form below. If you are looking for a specif part number, please include it with your message.